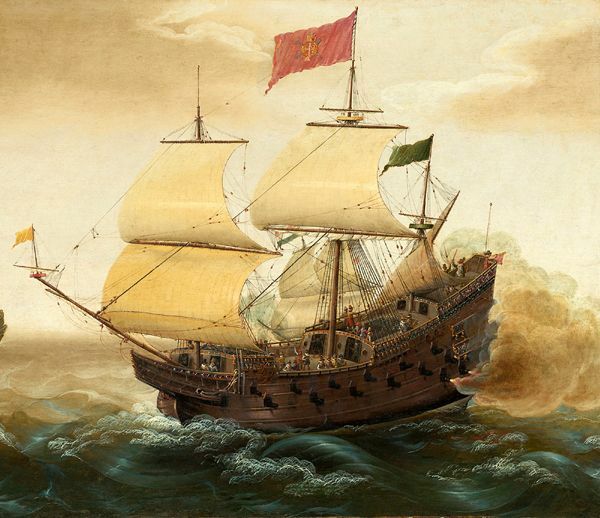 Pirates and piracy on the high seas are almost as old as history itself. This profession, based on the greed of mankind, can be traced back to that era when man first discovered that rafts, and later boats, could be used to transport his worldly possessions. There were always other men who cast covetous eyes upon these goods and desired them for their own. On land these persons were termed robbers; on the sea they were called pirates. Even the Bible speaks of “Princes of the Sea” who struck terror into the hearts of honest men. The great Roman emperor and conqueror, Julius Caesar, knew from personal experience what it was like to be captured by pirates. Sir Francis Drake, England’s great sea captain, was considered by many to be a pirate. In a like manner, John Paul Jones, our great naval hero during the American Revolution, was accused of piracy by the British. Thomas Jones, the captain of the Mayflower, the ship which brought the Pilgrims to the New World, had earlier been imprisoned on a charge of piracy. Long before the first permanent English settlement was established at Jamestown, Virginia in 1607, piracy was flourishing off the North American coast. After getting the jump on the other nations of Europe in planting colonies in the New World, Spain was fast becoming one of the wealthiest countries in the Old World. Fabulous wealth in gold and silver was taken from the mines of Mexico and Peru. This treasure was, in turn, carried back to fatten the purses of Spain. At this time, England was the mortal enemy of Spain, and every ship taken by pirates weakened the enemy just that much. Therefore, rather than trying to stamp out the practice of piracy, the English encouraged piratical activities — as long as only Spanish ships were attacked. Great galleons, plowing majestically through the rolling seas, became easy prey for the swift darting ships used by the pirates. That part of the ocean near the Spanish mainland colonies became known as the “Spanish Main,” a favorite hunting ground for pirates. And because England and Spain held little love for each other, the Spanish Main swarmed with English pirates. These renegade Englishmen were not always too careful as to the nationality of the ships they plundered. Sometimes they captured English as well as Spanish ships. Because they were located within easy sailing distance of this favorite hunting ground, the English islands in the West Indies became the favorite hangouts for these free-booters. 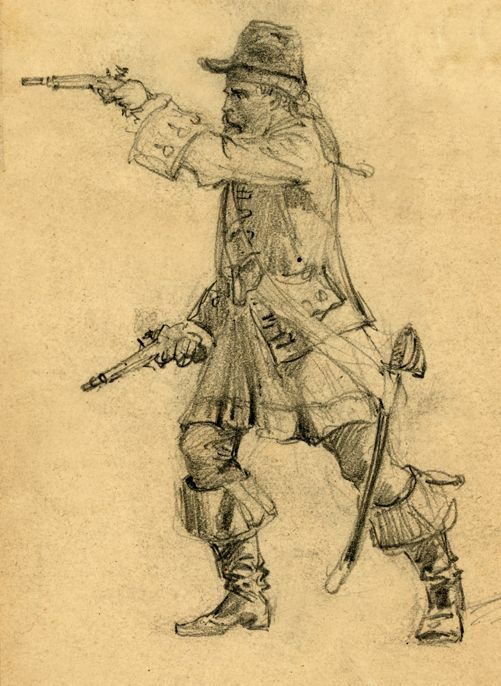 The word “Buccaneer,” so often used to describe pirates, had its origin in the West Indies. Originally the name was applied to runaway Frenchmen, often political or religious refugees, or escaped criminals. Somehow they had reached the West Indies, where they lived among the native Carib Indians. A large number gathered on the western part of the Island of Hispaniola (present‑day Haiti) which was otherwise thinly settled but well stocked with cattle and pigs. From the natives, they learned a process of curing the meat of these animals without a fire on a wooden frame called a “boucan.” As a result, they gradually became known as buccaneers, a name often applied to all pirates in general. By 1700, the British Government felt it necessary to take steps to stamp out this nest of pirates. The buccaneers had become too careless in the selection of their prizes. English ships were being taken as often as those of other nations. Feeling that it would take a pirate to catch a pirate, Captain Woodes Rogers, a famous privateer, was appointed Governor of the Bahama Islands in 1717, with instructions to wipe out the freebooters. King George I had also re‑issued an old Royal Proclamation which granted a full pardon to all pirates who would come in and take an oath to become law-abiding citizens in the future. Many took advantage of this offer and made an effort to settle down peacefully. 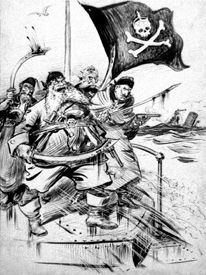 Some, after taking the oath and accepting the pardon, discovered that they were unable to stomach the dull life of honest men, and sailed once again under the Black Flag. Quite a few of these were later captured and died dancing at the end of the hangman’s rope. Others, not wishing to make the change, set their sails for the North American mainland. 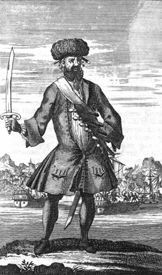 Among them was one Edward Teach, who was to become far better known as Blackbeard. Piracy had become big business in the American mainland colonies as early as 1689. The period from this date until 1718 has often been referred to as “The Golden Age of Piracy.” Basically, the English Parliament, the prime legislative body of Great Britain, was responsible for the welcome pirates received in the colonies. Unpopular trade laws had been passed which hampered colonial trading activities. So disliked were these laws that smuggling was not considered wrong, and when pirates began to bring in cheaper goods on which no customs duties had to be paid, no questions were asked except the price. So profitable did this illegal trade become that many otherwise respectable citizens became indirectly concerned with piracy. 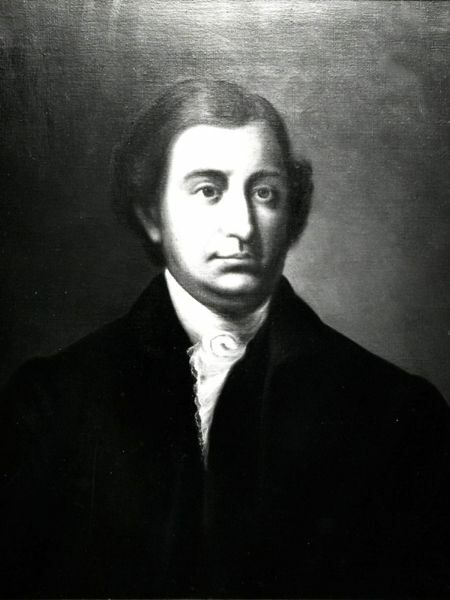 This official was Edmund Randolph, the Surveyor-General of Customs in the American Colonies. He was a most conscientious man, so much so that he waged almost a one‑man campaign to eliminate pirates and smugglers in America. The governors of the individual colonies, who should have aided him most, were reluctant to support his activities. In his report back to England in 1696, addressed to the Council of Trade and Plantations, Randolph charged that “Pyrates” were actually welcomed in all American ports, and he listed those of Massachusetts, Rhode Island, Pennsylvania, and Carolina as being the worst offenders.